In this article we will discuss project manager interview questions and answers. Executives, board members and HR managers always recognize the importance of hiring efficient project managers to perform the projects of the organization. They are sure that skilled and experienced project managers are almost their most valuable resources. According to the reports of the PMI (Project Management Institute) due to poor project management, over $122 million is wasted for every $1 billion invested in the United States. This shows that hiring an efficient project manager is key to prevent losses. However it is difficult to select the most suitable candidate among many other applicants. While hiring an eligible project manager, HR managers review them in a number of ways and they should ask several questions to themselves. Is the candidate suitable for the culture of the organization ? Will the candidate successfully guide the team members and manage the project ? Is the candidate capable of delivering the project on time and budget ? Since there are lots of unknowns and uncertainties, it may be difficult for a candidate to finalize the interview successfully. However, focusing on key areas and practices helps to give the correct answers to the questioners. 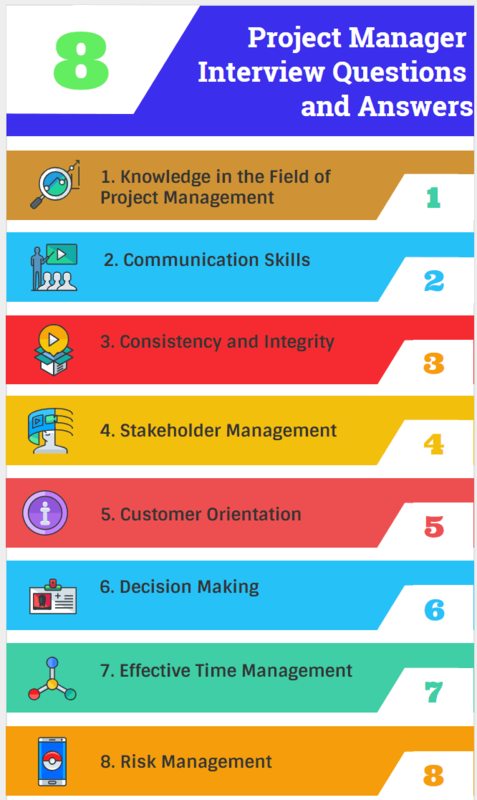 Here below you can find eight important areas of project manager interview and questions that help you to understand how to answer the questions during the interview. A project manager should have knowledge in he field of project management as well as having experience. If one of them is missing, he will not perform well while managing project team and resources. Having a solid foundation in project management processes and knowledge areas will help to get succeed. Question : What are the problems that a project manager will face during the execution phase of a project ? This question tests your knowledge and experience in the project management processes. As you know that executing is one of the five processes in which the physical project deliverables will be built and presented to the client. Think about the challanges and give examples considering your past projects. Project managers spend most of their time with communicating people. They communicate with stakeholders, team members, client representatives, vendors, suppliers and others who involved in project. Therefore having good communication skills is key for a project managers success. Question : What kind of communication problems did you face in your previous project ? The questioner tries to understand if you are a good communicator or not. Think about the problems you faced with vendors, suppliers and sub contractors and give examples of your communication techniques to manage the situations. Project managers take active role in managing critical responsibilities and resources like money, people, funds and machinery. They guide their team members and represent the organization. Therefore they must be consistent while taking decisions. Question : How do you communicate bad news with your team members and sub contractors ? As a project manager you may have to deliver bad news related with funds or payments to the sub contractors or team members. The questioner wants to understand how do you plan communication process when you receive the bad news. Stakeholders have various influences and effects on the project goals. Therefore their expectations should be managed and fulfilled for a successful project completion. Project managers are responsible for establishing and maintaining effective relationships with the stakeholders and responding their needs. Question: How do you ensure you and your team deliver stakeholder expectations? The questioner wants to understand if you are capable of managing stakeholder requirements or not. As a project manager it is your responsibility to classify the stakeholders according to their power and interests and manage them. Give specific examples and detail the processes how you manage their expectations considering their power and interest. Project managers must be customer oriented. They are responsible for understanding their expectations and fullfill their reqirements in a timely manner. Question: How do you develop good customer relationships in your projects? The questioner seeks to understand if you are aware of the importance of developing and maintaining excellent relationships with the customers. As you know that customers are the main funders of the projects because they make the payment. Give an answer showing that you feel this way. Project Manager must have high decision making capabilities. They need to be able to identify and prevent issues from impacting their projects. Question: Can you give a few examples of decision making to prevent issues in your past projects? The questioner seeks to understand if you are capable of taking proactive steps and avoiding procrastination. Think of real life scenarios and give examples that include the workplace. Provide answers showing how you handle setbacks rather than showing how good you are at your job. A project manager is often busy with multiple tasks and issues. A successful project manager mostly prioritizes tasks considering the limited resources and the milestones of the project. Question: How do your project project will be completed on time ? This question tests your knowledge and skills in time management. Give examples of which tools do you use to develop project schedule and track the performance. List the softwares that you can use like Primavera P6 or Microsoft Project and give real life examples how you managed the schedule of your past projects. Risk management is an indispensable part of project management because there is no risk free project. Therefore a project manager deals with managing ambiguity and risks to prevent his project from uncertainties. Question: Give a few examples showing how do you deal with high level of uncertainties in your current project ? No matter if you’re managing a software development project or a hospital construction project, you have to deal with risks. Give examples of what kind of risks you faced and how did you tackle with during the execution phase of the project. In this article we discuss eight important areas of project manager interview and questions. As you can see, the questions cover the most important project manager skills and competencies. We recommend you to read these project manager interview questions and mull over them to create your own answers during the interview.